Reverend Toller (Hawke) is experiencing a crisis of faith and has been since the death of his son in Iraq. The narrative flirts with balancing destructive and creative forces, and it also gets into hypocrisy and our inability to think critically when compromised emotionally. 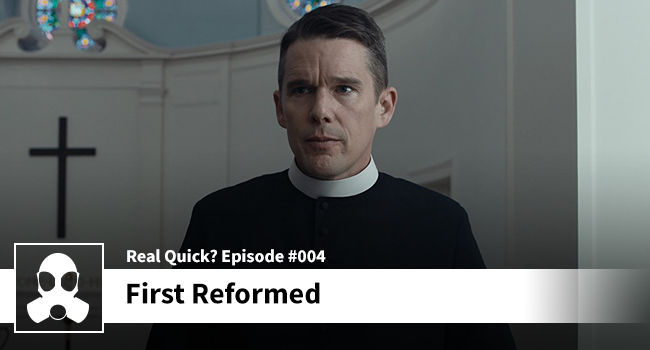 First Reformed didn’t play out exactly like I though it would but it did present some interesting ideas to consider. The idea of balancing hope and despair (read: wisdom) against a world of extremes. The Michael character introduces some environmental extremism (global activism) into the narrative that wasn’t exactly expected, but it seems to serve the film despite – at times – being a bit preachy (pun intended). Plenty of meat on the bone, and in this episode – like Red Sparrow – I made a decision not to spoil the ending as it is largely interpretive. I’d say it is worth the watch.